I am a person who really plans. I guess its in with me, I planned the course to take in college when I was still in Grade 6. I planned that at the age of 20 I should graduated at college and would you believe that even having a boyfriend at the age of 24, is a plan? All of those plan was prospered. I had the college course I want and in preparation with a higher level that I want to take. Its really my dream to become a lawyer ever since I was in grade 4. I graduated at my college course at the age 19, year ahead than my plan. My plan is to work in a government agency or to teach as a college professor but it didn't happen as I planned it. I was very ideal that when I graduated young with a good grades and credentials I can easily get a job. But it didn't turn that way, so instead to waste my time just staying at home and waiting for calls from companies I decided to enroll again. I took the exam in the College of Law, passed from it and although that time I was still confused whether to pursue it or not. My parents told me that they will support me but behind my mind is confusion whether to pursue it or not. I told to myself before that I will be in law only if I have a job to personally support myself - I don't want them to be disappointed "if" I failed on my classes, ibang level na kasi ang Law, especially most of the subjects are pre requisite from one another. I was then in line to enroll even I was confused until my college dean saw me, she asked me to see her office before I pay for my enrollment, she talked to her and explained everything what's the possibility between taking Bachelor of Law and Masters Degree. "Bachelor" pa lang noon ang Law in the university na pinapasukan ko, so meaning if I will not pass the bar exam para lang ako nakatapos ng isang degree unlike today na Doctors of Jurisprudence na, even hindi ka makapasa sa bar consider as PhD. graduate ka na. It seems to be just yesterday but its already 10 years when Mommy go up in the stage with me and put my hood as a graduate of Masters in Public Administration. I didn't plan for it but it all happened. I forgot to tell you one of the main reason kung bakit nagdalawang isip ako na mag-law, iniisip ko na baka ma-compel akong magsinungaling if ever na haharap ako sa court, yup I don't know that much pa about law professions hindi pa ganon kalalim ang alam ko na pwede ka namang hindi humarap sa korte, and aside I'm just still a baby Christian. God answered my prayer to direct me on which path He wants me to be. He used my college dean for me to know and help me to decide. No regrets to my decision, I am happy and fulfilled that even I was not able to step in Bachelor of Law, I was able to finished my Masters. And aside who knows if its really just not God's plan for me noon, malay natin in future pala. I believed GOD planned it all for me. There are so many things that we planned, polished everything but lets admit it there are some that didn't prosper, it turned out the way we want it to be. But there are things that we didn't plan yet it happened, least to our expectation to reach but we did. The Lord knows the desires of my heart; His ways are better than mine and whatever His plans on my life, let His will thy be done. Planning for me requires hope, prayers and actions. The time we're making plans we're hoping and praying - hoping that it will happen the way we want it to and praying that God will lead us and make it happen according to His will. In order to see whether our plans will prosper or not, we need to make action - give a try and do our best. When I was still studying, every time I'm in discourage, I boost myself in telling these: "There's no harm on trying" or "If others can, I can also". We need motivation, and if you doesn't received one from others, try to do it by yourself. Making plans are important, it will be our guide on which path to take but what my point is if we fail then get up and try again. Try and try nga daw di ba until we succeed. Sometimes during the stage of planning there were fears - what will happen to us after, where are we going. I have those fears as well knowing that the project of the company I am working will soon to finish. But ever since I lay it down to the Lord and trust in Him that everything will be fine according to His will, I am at peace now. I know He has great plan for me, and I'm holding unto it. Maybe you will say "ang yabang naman nito or ang hypocrita naman hindi raw natatakot mawalan ng work". Everything comes into an end, and all of us want a new and big package more than to what we are receiving right? pero kung may hawak ka pa ngayon at bibigyan ka paano mo pa hahawakan. We need to let go what we have so we can have new one. But of course as I've said actions are needed. Do not worry the Lord shall supply all of our needs according to His riches. All He is waiting is for us to ask. And speaking of plans, there are happenings that you didn't plan but it turned out more than to your expectation. Yesterday while we're in the canteen for the 5pm break, after we ate our early dinner biglang nagkaayaan pumunta ng Katara and for less than 30 minutes we are in the reception to punch out. Well despite of the hot temperature according to the news this weekend, sure it will not hinder for some who really love to shop to come out. So expect that still many people will be in malls. 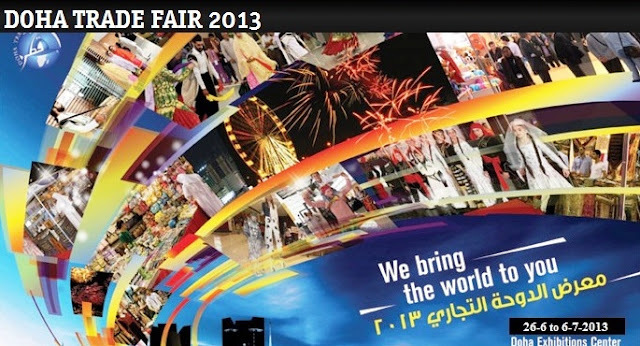 If you are thinking where to go this coming weekend, why not give Doha Trade Fair 2013 a visit. The Doha Trade Fair is the biggest shopping carnival of the year. 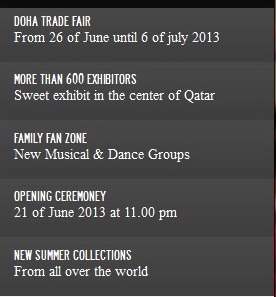 It started on June 26, 2013 and will end on July 6, 2013, at Doha Exhibition Center. There are 29 countries who will be showcasing and selling a wide range selection of their products originally made from their country. A huge selection of bags, shoes, jewelry, cosmetics, furnitur, household items, ready made garments, accessories, herbal products, carpets, computer and electronic gadgets and more. "I Won't Give Up On You"
How will you go far for love? Up to what extent are you willing to sacrifice - for the relationship and for the one you love? Kalma lang :-) yup its not Valentine's Day yet and this is not an advance post for next year VDay. And yup I'm still the same Jen that you know, blogging about lifestyle and anything under the moon and stars. So what's this post about, well I just get inspired with the people I know personally - their story. Stories about how they started and hold on to each other inspite and despite of all the challenges they have been through over years and decades. Just thinking, could I do the same? well well this is not about me, tsaka na lang natin pagusapan ang "ako". But before I go on, let me just make my apology (in advance) to these couples that I'm going to feature, they doesn't know that I will be blogging their stories here, hahaha. Actually this is not solely their stories, these are what I know about them and why I do inspired on their stories and of course I will not put them in here if I don't love them. I love these people and I do look upon them. I witnessed several cases how both party suffers when they broke up from each other after so many years of being together. It took them 5 years, 8 years, or even 10 years being in a girlfriend-boyfriend stage but didn't reach into the aisle and exchange lifetime vows. My Dad once told me when I'm still in a relationship na if ever daw na gusto na naming magpakasal two years are enough to know well each other, as long as sure na..hmmm well sorry to disappoint you on that side Daddy, I'm not yet ready..hahaha. Why he said it, because na-witness daw nila sa common friend nila ni Mommy how both party suffers after the break up. Yung hindi ka na halos sanay or kaya na tumayo sa sarili mo kasi sanay ka na laging may kasama. Guys, may it be a lesson for us, loving a person is different from being dependent to the person. We have are own life to live, a life not depends on ones existence. I called them Tita Ninang and Tito Ninong. I met her at Graduate School during my MPA days, she became my partner in one of my research project, and we became friends. No wonder she's in here, she's one of my best friend. Both them are working as a public servant - Tita Chie is working in COMELEC, Sto. Tomas Batangas while Tito Manolo is in Municipal Hall of San Juan Batangas. I heard their story straight from both of them actually but more on Tita, hahaha. Are you ready to give up your career over a marriage? Of course without thinking its easy for you just to say "yes" normally it happens when a man popped up a question to a woman, kasunod na discussion on "career" set up in future or after the marriage most especially if your partner is not that in favor of career path that you are walking into. Let's face it there are some careers or jobs that can really affect the family relationship or for the couples and parents to be sa paghahandle nila ng family. What if you're at the peak of your career, are you willing to give it up and give way to the path you don't know what is in the end? Parang movie lang pero it happens in reality. 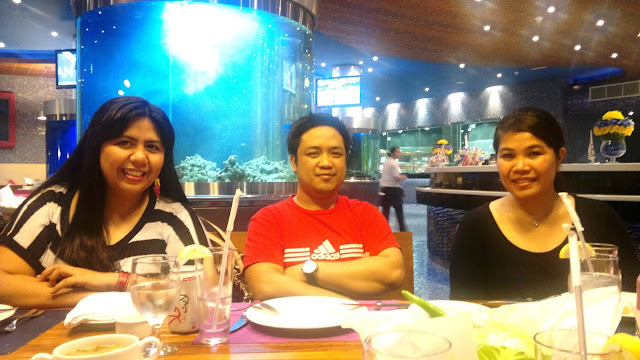 Like Tita Chie I met Ian in Graduate School, he is my thesis partner until years passed by until now my best friend. I witnessed the first time Eden and Ian exchanged vows in a civil wedding. 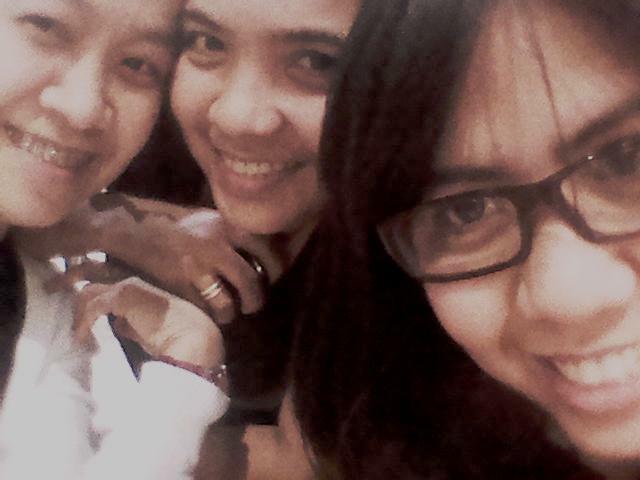 Its only me, Tita Chie and the couple. Ian is opened to me about her girlfriend Eden actually to all of us his friends its just so happen na mas close nga lang kami that's why. It took him years daw before he finally get "yes" for Eden to become his girlfriend. He never give up on her. When I met Ian, parang 6 years or more than na yata silang steady as gf-bf and everytime we asked him kung bakit di pa nagsesettle down, he's always telling na may right time daw. 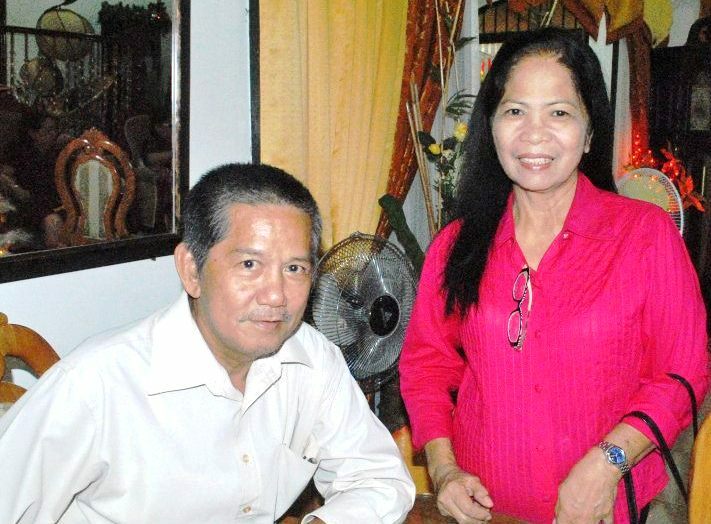 During those years, nasa peak of his career sya, he won as the 2nd councilor of Sangguniang Bayan in Rosario Batangas, in short politics is his game. Eden is then working as med-tech if I'm not mistaken in one hospital. According to Ian, Eden is "not much" favor being Ian into the politics, well knowing politics naman talaga, iba ang laro. There is a condition, Ian will just finished his second set of term and stop into the politics and they will get married. He was offered to be a Vice Mayor then, I think he is the youngest in the line that time but he refused. I remember its our final exam in the Graduate School not ordinary "final" exam, para syang board exam actually if we fail hindi namin makukuha yung diploma namin with certain serial number like license number, I forgot what they call it, where in the library and reading broadsheet when I turned the page I saw a picture of a big house, then I showed it to him. And with a sad voice he said "sino pang ititira ko jan kahit magkaroon ako" and I learned from him that Eden will be leaving the next day to UK. He just learned everything the day yesterday, ayaw kasi ni Eden mawala yong concentration nya sa exam. After year or two, I'm not exactly sure, she come back and Ian then is still councilor. He called me and ask help as he knows naman na may alam rin ako about civil code. In short, they get married in civil, its a secret marriage actually, why civil and SM kasi nga yung time of preparation. They renewed their vows in the church 2006 and now they are living in UK with 2 beautiful children, their eldest named Anya is my god-daughter. Its not easy to give up the lifestyle that you used to have, he went through a big adjustments, the daily life he used to have in Philippines - he used to have his driver and body guard, the food will only be served to him, he has "kasambahay" in their house who will wash and iron his clothes, he has his own secretary in his office, and so much more. But as I've talked to him all those adjustments has been paid off having a wonderful family - a happy and at peace family. For some they might say na pwede namang pagsabayin but as my view as well giving up sometimes for something and giving way for new one is the best option to take. I know their children will always be proud of the decision he made. Its been years I didn't see them but from time to time we still communicate and I'm so happy how his life as a family man going well. Meet Kuya Mike and Ate Caren, they are my brethren at QICM (Qatar International Christian Ministries) and we are in one bible study cell group. The first time I met them with their children everything seems to be harmonious, I mean it seems they didn't went through challenges and trials in life. Kuya Mike is "kengkoy" but he is a man of words while Ate Caren is sweet and thoughtful, and no wonder their 3 children were raised with manners and fear on the Lord. The first time I heard their testimony on how they started their family life I'm a bit emotional, why? because I'm thinking what if I'm on Ate Caren shoes? can I bear it all. 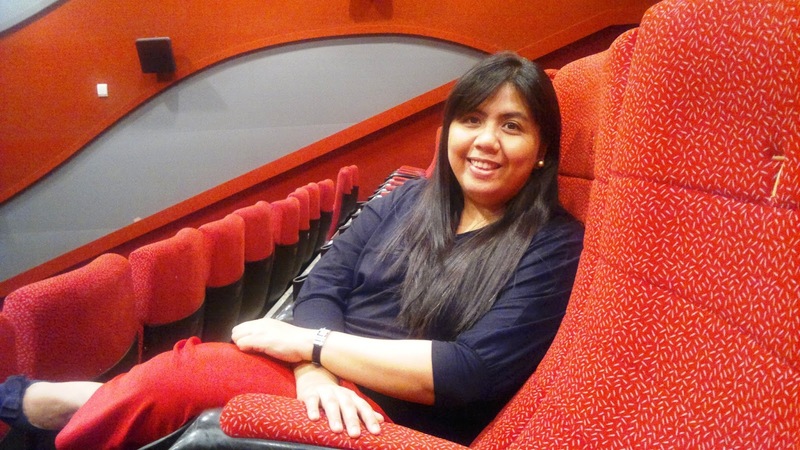 Like any other woman Ate Caren wants the best for her family, she wants to have a happy married life and family of her own. But aspiration to have one is not enough to achieve everything. Married life before seems not to be an ideal thing - kabi-kabila away. most of the time they are hurting each other through words and maybe sometimes physically but she didn't give up. She's from a broken family and she doesn't want to have the same. 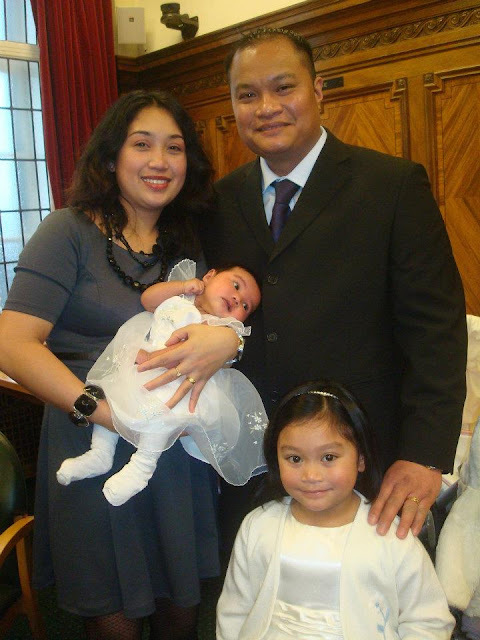 Ate Caren is the first to become a Christian in her family. She's still a baby Christian that time, and whenever there are bible studies and church services she carries her 3 children. Whenever she asked Kuya Mike na sumama sa mga BS and church services ang dami nyang alibi kesyo magluluto na lang syang para may kakainin ang magiina paguwi from the church, 'pag may mga bible study ang daming pupuntahan. Iniisip ko pa lang how difficult it is to be in the same house with different faith - sisimba kayo pero di kayo magkakasama, magpra-pray sa harap ng pagkain pero may isa na kumakain na, and how about sa pagpa-pray, at kung ano-ano pa. Ate make a stand despite of Kuya is not a Christian she fight for her faith, akala lang ng iba madali yon pero mahirap ang ganong set up especially you have children who needs attention, proper guidance and can see how's their environment especially inside the house itself. Kuya Mike is now a Christian, Ate Caren's life has been an example and living testimony on how good God is and how amazingly God can change ones life. They are blessed to have 3 children - Carl. Vixen, Mikah who are also serving the Lord at their young age. Just this year their eldest Carl started his college in Philippines, we're all praying for him that kung paano sya ginamit ni Lord here in Doha ganon din sya pagamit in Philippines. Truly a Christian faith that we have must not compromise over a certain person, or over things. The Lord knows the desire of our heart all we need is to wait for the right time, I know like Ate Caren there are some of you are hoping and still praying that your loved ones will one day accept Christ as their personal savior too and one day you will be together in Church services too. So don't give up and keep the faith burning, live by example and be your neighbors bible. 33 years of being married to each other is an achievement after all the trials, challenges, storms, or even you call it tsunami or tornado. I am a witnessed of how they surpassed it all and their story will always be a lifetime inspiration for me. For those who are visiting here in my site you might read already the love story of Mommy and Daddy, how they started as boyfriend - girlfriend and get married, but for those of you who doesn't really know just read it HERE :-) Their story is not a fairytale as in, I'm just a proud daughter how they overcome everything and how living happily as family. They are not both Christian before, my parents strive hard in order to get a good job and to give us the best that they can. As a children we have nothing to ask for, they studied in a private schools, we can have a the latest toys, shoes or clothes but honestly what I am thankful is nung bata kami we know what's "enough" means at ang salitang "hindi pwede", maybe one of the reason also for us not to be called as spoiled brat and mas lalo namang hindi deprived. But as we grow our eyes were opened that material things are just temporary and what we want is a happy and peaceful family. Happiness not found in material things and peaceful home not only if Daddy is not drunk. As I recall how our life before - yup we have almost everything pero kasabay ng pagka promote ng Daddy sa work, kasabay ng pagtaas ng sweldo kasabay rin ng unti-unting paggulo ng family namin - madalas syang lasing sa alak at sa sugalan, madalas silang nagaaway ni Mommy, nawitness lahat namin yon. I was in highschool then when Daddy decided to work abroad, despite of his good job in the government, nagising sya na malaki ang tendency na masira ang pamilya namin kung patuloy sya sa ganoong gawain. My mom didn't give up, sa dami nyang pinagdaan, added factor pa yung mga taong feeling concern pero in the end makiki-chismis lang pala, the emotional burden she had, but she never give up - never give up to Daddy. 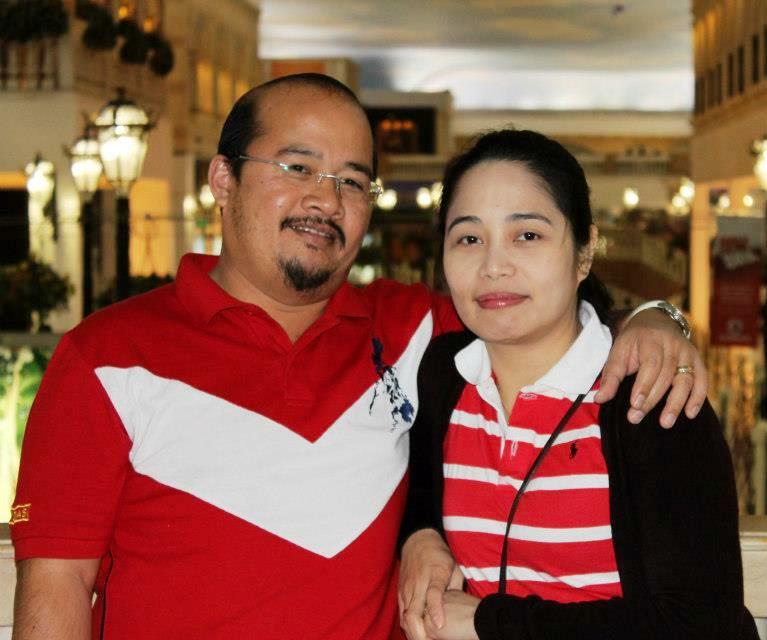 My Dad accepted Christ as his personal Savior in Saudi, naging born again sya. Almost everyday sumusulat sya kay Mommy as in may reference number yung mga sulat nila para alam if ever may hindi natanggap, hindi pa kasi uso that time ang internet, wala pa ring cellphone. My Mom followed, but there's a resistance on us. I remember na kinausap kami ni Mommy, as an eldest ako ang nauna, sinabi nya sa akin na ano daw ba ang gusto ko yung dating buhay ni Daddy at magulong family or yung born again na si Daddy at peaceful and happy family kami. I just cried. After two years bumalik si Daddy, hindi naging madali for me and my brother ang pagbalik nya feeling namin we have someone stranger na kasama sa bahay, walang mga kabarkada nya ang pumupunta para makipaginuman kung meron man kwentuhan pero coffee or juice or iced tea lang, most of the time nasa bahay lang, hindi mo na sya makikita sa mga sugalan, hindi mo na sya maririnig na nagmumura instead words from the Bible ang maririnig mo. He didn't force us to do the same pero nakita ko talaga how he live his life, everything seems to change, nung una ayaw ko pang maniwala that it is possible pero it counted years until I myself accepted Christ too in my life. And I never regret it from the day I accepted Christ, truly I am very thankful that the Lord used my Dad's life - he lived by example, he is as a living testimony for us. My mom said "kung hindi naging born again si Daddy malamang hiwa-hiwalay na tayo" . Everytime I was reminded of those words from Mommy I feel more and more blessed and thankful how God works into our family. But don't think that after that is all smooth, marami pa rin kaming mga pinagdaanang pagsubok but the only difference now, we are facing it as a family, we are facing it with God. I'm so much thankful for my parents they both didn't give up for each other and for our family. How long are you ready to hold on for a relationship especially for a marriage? Its a lifetime vow, a lifetime covenant and lifetime means till death. 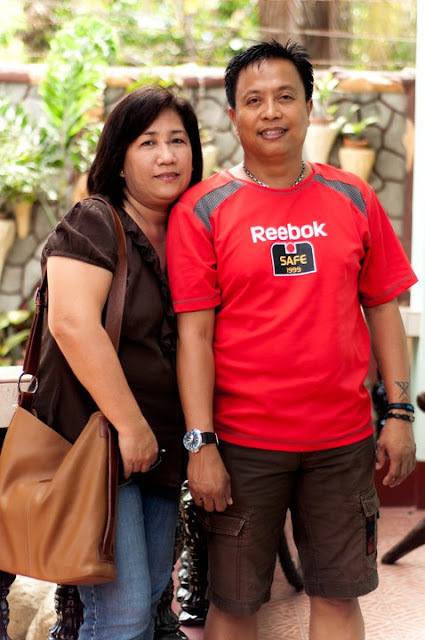 These are only few couples that really inspires me, I am blessed with people whose life, their married life opened my eyes about the married life; that its not all about happiness, its not all about being together, its not all about emotions of love - its must be more that "being" than "about" . Being patient, being selfless, being strong to face any challenges together, being an overcomer, and so on. Husbands, love your wives, as Christ loved the church and gave himself up for her, that he might sanctify her, having cleansed her by the washing of water with the word, so that he might present the church to himself in splendor, without spot or wrinkle or any such thing, that she might be holy and without blemish.In the same way husbands should love their wives as their own bodies. He who loves his wife loves himself. For no one ever hated his own flesh, but nourishes and cherishes it, just as Christ does the church, because we are members of his body.“Therefore a man shall leave his father and mother and hold fast to his wife, and the two shall become one flesh.” This mystery is profound, and I am saying that it refers to Christ and the church. However, let each one of you love his wife as himself, and let the wife see that she respects her husband. Marriage is more than the wedding. So to single men and women out there including me, think a million times before saying "I DO" as the vow you uttered in a day is a lifetime commitment and covenant. To all couples, Kudos to all of you for being tough in facing all the challenges of a married life and for striving hard to your family and most especially for never giving up inspite and despite of what you've been through. Shopping malls are one of the busiest place in Qatar especially on weekends and holidays where people shop, mingle, eat, watch movies and sometimes just to ease the heat of the weather. When I first arrived Doha in 2006, it has only Landmark, City Center, and The Mall after a year Villagio opened, and now there few malls recently opened its gate to the public, Ezdan is the most recent. No wonder kung gaano ka-shoppingeras and shoppinggeros ang mga local citizens dito, ay co-shoppers baka masabi nyo talaga kung tayo rin yon kahit maghapong magshopping :-). Late last year when Qatar opened the Doha Festival City (DFC) where you can find IKEA and this year the Ezdan and Al Dar Salam Mall. But it doesn't stop there, expect that new malls will sprout this year. Let me give you some dose of it. 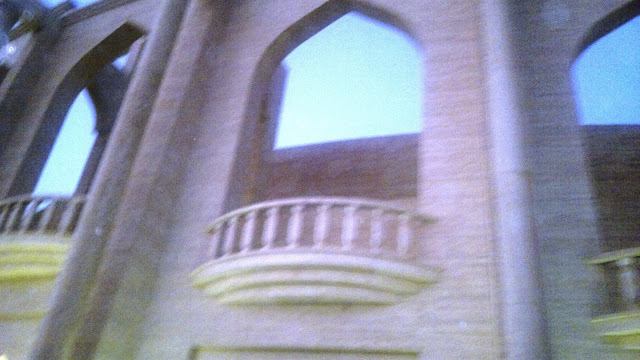 It will be linked to the Landmark mall via footbridge. 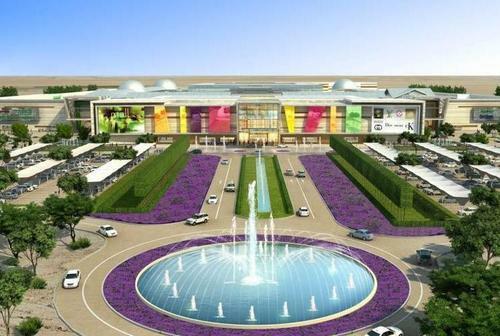 This mall will be of traditional build with 13 screens cinema, children's play area and game zone, food courts, and basement parking of 1,600 cars and not to mention its retail space of 160,000 sq.meters. O di ba bongga sa dami ng sinehan, ewan ko kung magsiksikan pa sa box office hit movie kapag nadagdagan ng another 13 screen, for sure Gulf Mall will be another weekend destination for families. If you happened to pass on Abu Hamoor road you can see that the construction of it is on going. Barwa Commercial Avenue is set to become a lively residential and lifestyle destination offering of 1,000,000 sq.m of state of the art facilities supported by the advanced network of infrastructure. 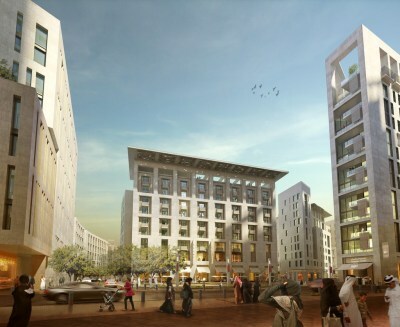 It will be located in Central Doha. 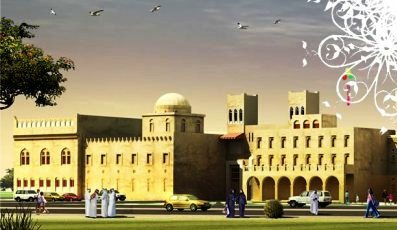 Its main purpose is to preserve and regenerate the historic "downtown area" It is an integrated masterplan of residential, commercial, hospitality and leisure attractions aimed at local residents and the growing number of visitors to Qatar. One of the later phases will include the construction of a purpose-built mall of 42,000 sq m over four levels with 100 stores, a supermarket, food court, a major department store and cinema. The project cost is QR20billion for five phase, 31 hectare. 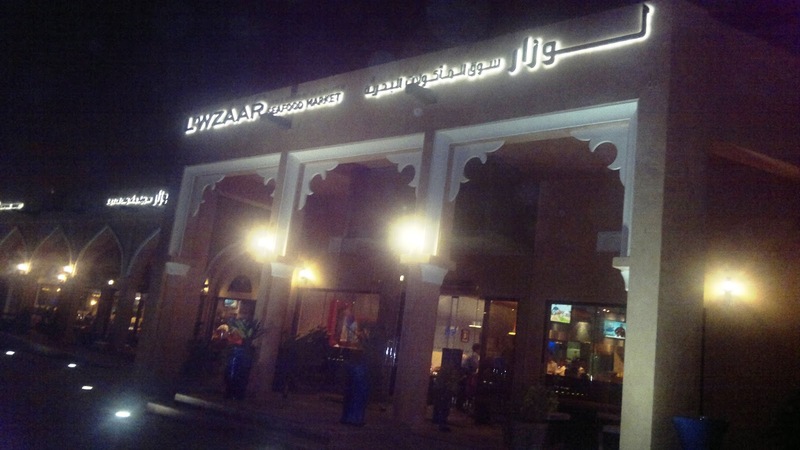 So at least the next time you visit on that area aside from Souq Waqip surely you will enjoy this Msherib Downtown Doha. 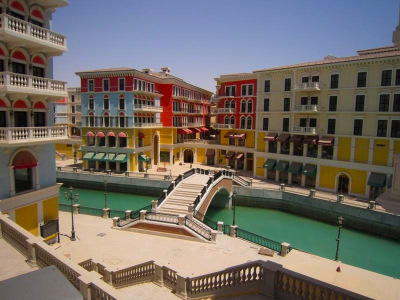 Qanat Quartier or the Little venice will open this year at The Pearl Qatar. The residential area consists of apartments and townhouses with architecture reminiscent of Venice and Amsterdam – pastel coloured, low-rise buildings complemented by piazzas, canals and a marina. There will also be 400,000 square feet of ‘festival’ shopping. UrbaCon General Contracting has announced the plans to build $824million (QR3billion) located at the intersection of Al Rayyan Highway and Celebration Road, close to Education City. The three storey mall is slated to open on September 2015, two years na lang mga shoppingeras - shoppingeros meron na namang place to shop. And another good news, the mall will be having its own Metro Station and parking for 7,000 cars, bongga di ba? siguro naman di na mapupuno yon sa isang araw. Size wise it will be three times of Villagio but smaller than Doha Festival City. In terms of brands of retail offerings, it sounds similar in scope to Villagio, with a dedicated luxury retail wing and cafes and restaurants making use of what the designers call “an indoor streetscape.” A luxury hotel is also expected to be built onsite. So sa mga shoppers na napagod sa pagshoshopping at di na makapagdrive may hotel na, saan ka pa.
Every year the demand of Qatar in its facilities are increasing as its people get bigger as well and not to mention the expatriates. Anyhow upon opening or even in just constructing those new facilities is a great opportunity for the expatriates to work here. 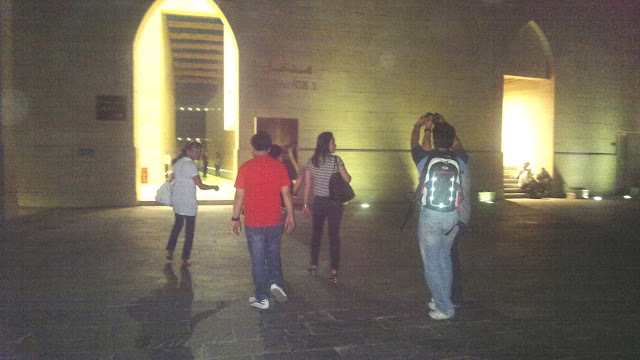 Likewise when those malls will fully opened, it will open great opportunity as well to our fellows to work here in Qatar. For us who's working here for so many years and mostly for some who spent half of their lives in staying in Qatar, progress in such kind is really a good news. I, myself is a witness how Qatar from 2006 until now restore, regenerate, and change its beauty. New malls will not only benefits the shoppers - locals or expats but mostly those people who wants to establish their working career in here. Its better late than never! Yup last night I had a chance to watch Clark Kent - Kal -El on the big screen. Just like any other who already watched the movie, thumbs up! 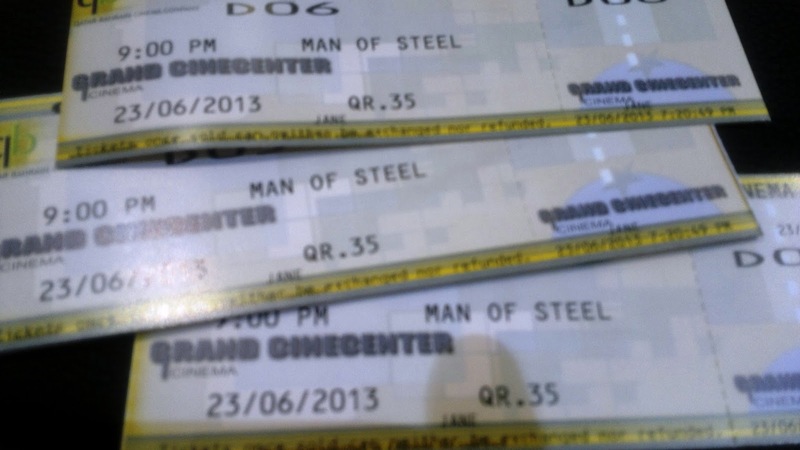 For me, Man of Steel is not just a story of super hero, the good and the evil but for me its more about love, choice and decision making. I' ll try to do a movie review post separately. Last night another gifted and talented shine not only in the stage but in all social network sites. If you missed THE VOICE, PHILIPPINES episode last night then you can't relate to what I am saying. I watched it late at night, although I'm seeing so many post of her video, her performance but I didn't try to open it, I want to watch the whole episode. Lee Grane is her name, name pa lang pang international na ang dating. Before she sang there is an interview portion muna, and you can really see in her eyes the sincerity and honesty of what she could do to win the contest. Let's face it most of the people joins such kind of competition to win - for money, some are for fame and future career. And like any other, Lee Grane joined the contest for her family. She is the eldest among the family, and the bread winner too starting when her father died. She played in some bars with her band. All of her earnings are given to her family, she has a sister who is epileptic. She wants to send her sister for a treatment, although in the past they did but no doctor was able to treat her, lets face it that it will really cost big amount. How many Lee Grane do we still have nowadays? That's what thing I love for being a Filipino - the family ties that we have. Even we have our own lives, we didn't forget our parents, our siblings and sometimes even they do have family of their own. Lee Grane is an example of a tough woman, although she said its only outside, but eventhough. Everyone of us cried no matter how tough are we, and crying is not a sign of being weak. I believe there are still many Lee Grane nowadays, who are sacrificing their own happiness, wants, plans, and future for their families. There are many Lee Grane working abroad who chose to be away from families in order for them to give a good life, working hard as other says "ginagawang araw ang gabi", that's how hard working we are Filipinos, and we are doing all of that because of our love to our family. We don't considered it is an obligation nor even a responsibility, its out of our love to them. As the camera rolls and focused Lee Grane, you can see through her eyes that she sing from the heart, she sing with her soul, may pinaghuhugutan talaga especially on the second song that she sang. I don't know anything about singing I mean technically, all I know is to listen and if its pleasing to my ears then its fine. But last night when I heard her kahit pa nga siguro through earphone lang mo sya pakinggan mapapalo "I want you". Lea Salongga, one of the judges requested her to sing an English song, she sang "Angel" or much known as "In the Arms of the Angel" by Sarah McLachlan. This song is a very emotional song, lonely actually; a song about trying not to take responsibility for other people's problems and trying to love yourself at the same time. Bamboo, of the judge even cried, Sarah G. was really amazed and the two judges Lea and Apl regret for not pressing the button. The first song she sang is "Anak" by Freddie Aguilar, she made a good rendition, ang galing nya talaga! All of the judges were so impressed on her performance. It really shows on Lee Grane's eye how much thankful she is for giving the opportunity to be in THE VOICE. Truly she is gifted by a nice voice, some comments I read from social network sites "earmagic" voice talaga. Its really her heart's desire to help and support her family and being in THE VOICE is God's way of blessing her. I just read on few post by some of my FB contacts that Lee Grane is from my hometown and learned from my Aunt that she was my cousin band mate before my cousin left for US. I started to love Lee Grane, but don't get me wrong that because she's my "kababayan", from the same hometown but let's admit it she's sings very good, her voice is not the type of "birit" but she sings from the heart, with emotion that will really capture the hearts of every listener. Another pride of Batangas! Now I have something to look forward to in watching THE VOICE PHILIPPINES and I know most of you who watched last night will vote the same :-). For those of you who didn't watch Lee Grane's performance, I shared a video I've got from You Tube. I watched it three times last night and the last one I only listen her. And AMAZING! Lee was born and raised in Batangas but she left home at 19, to pursue her music. Lee is her family’s stand-in father, breadwinner and had been taking care of a mother and other siblings after her father passed away. Apart from sending her sisters to school, Lee also pays for her sister’s medication in her battle with epilepsy. In an interview, Lee was tearful when she opened up about putting her family’s necessities first before she could buy or do something she likes. 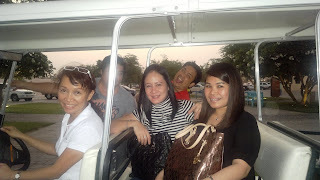 Last night I was browsing my albums in Facebook and came across to the trip I had to Dubai last November 2011 - it will be 2 years this year. And suddenly I miss the experience, and I started to reminisce. So since that time I was on and off in blogging, lets go back to what and how it was plus some personal tips when going on a tour. During Eid holidays expect that many people will go out the country and since 3 days holiday is not that long, the nearest refuge to have is Dubai. Expect the long line in the airport. Tip #1 During holidays expect the large volume of travelers in the airport so be there at least another one hour ahead on the normal 3-4 hours that indicated on your ticket. Tip #2 Be sure to put all the necessary documents on your shoulder bag or hand carry bag and take it out before you reach the immigration officer. Its fine to wait for some hours in the airport that reach there na ngarag ang beauty. You can enjoy chickahan with your travel buddies over a cup of coffee. Tip #3 Be with someone who is at least of the same passion with you in traveling, yung alam nyong makakasundo nyo the whole trip - isipin mo na lang if you'll be sharing with him / her the hotel room tapos di kayo magkakasundo. I was with my cousin Les with Mhaya the bear and my friend Ate Gidger and her husband Kuya Bart. Since our primary purpose is to travel and take a tour, so expect that most of the time, we'll be out. 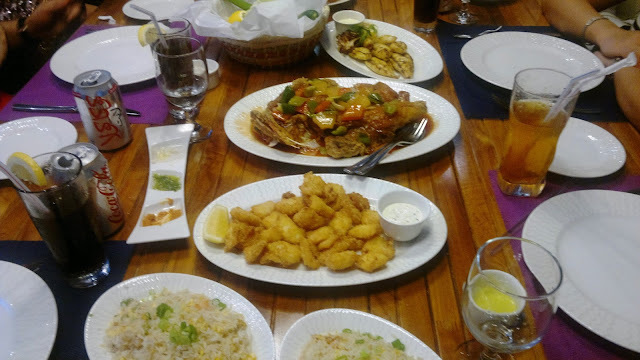 We check cheap yet "decent" - meaning its clean, service is good and even the place where its located is safe. Tip#4 Aside from checking the net, it would be better if you ask someone who had been there. One of our colleague refer to us this hotel and he gave us even the person to be in touch with. Two thumbs up for all the staff and crews who take care of us for our 5 days stay. We got 2 rooms - me and Les on room 303 while the couple are on the room besides us. Aside from the good, clean and comfortable room, we have also free buffet breakfast on our whole stay. Breakfast is only until 10:00 am and we make it sure not to escape from it...ang sarap kaya. They have amenities like pool, gym, sauna, jacuzzi, etc that all included. 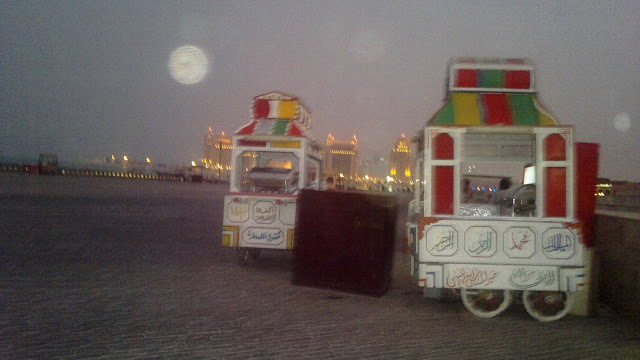 Ang natuwa ako may hair blower sila :-) e bulky ding na dalhin sa trolley yon, agaw space pa.
Before leaving Doha, we already made our itinerary, we do our own researches as we didn't get any tour packages. All by ourselves ang trip namin, and we enjoyed it. I think what makes the travel exciting is yung adventure na di mo alam kung saan ka talaga dadalhin ng mga paa yet you have enough information with you kaya hindi ka naman mawawala. Tip # 5 Make your itinerary, so you'll not waste your time. Do some researches which one is near to one place from another. There are some tourist destination na hindi pwede ang walk-in, you need to book and pay online, meron naman na mas mura sa online ang ticket than kung walk-in ka like sa AT THE TOP, kapag online booking 100AED pero kapag walk-in ka they will charge you 400AED. Dubai has so many parks that the kids will really enjoy and even those who are young at heart. Dolphinarium is just few steps from Children's Park, so we give it a peek what's in there. They have bicycles for rent - for children and even for adult. Dubai has so many malls - well they are the shopping capital in the middle east, so no wonder why. They have big malls and when I say big its really very big. You know me guys I love walking into the malls even I will not but something but there, ang beauty at ang mga paa ako ang sumuko. Among the malls that I visited, I love Wafi Mall, where good looking people are roaming around...hahaha. 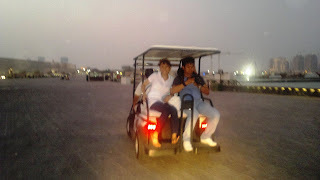 If you are my friends on my FB, you may read that when I was in Dubai cos I posted it as one of my status. Aside naman for good looking people, I love the Egyptian theme of the mall, actually ito lang mall na ito ang binalikan namin ng twice, they have some lights presentation na mavi-view mo all over don sa mismong harap ng mall - amazing talaga! 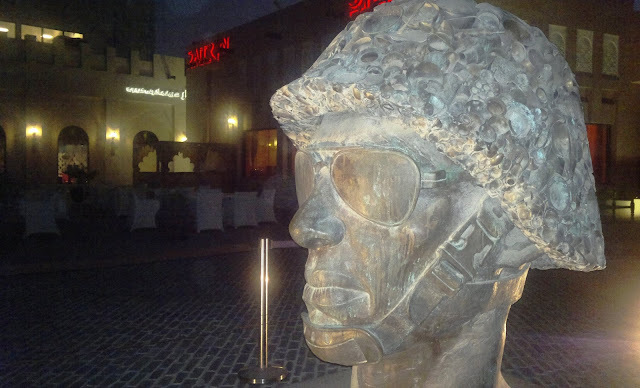 We are fortunate as we visit Wafi mall then, their exhibit is on going and its for free :-) Mostly are works of art and handicrafts from different countries in Middle east. I've both one silk scarf kahit mejo mahal pero souvenir na rin. 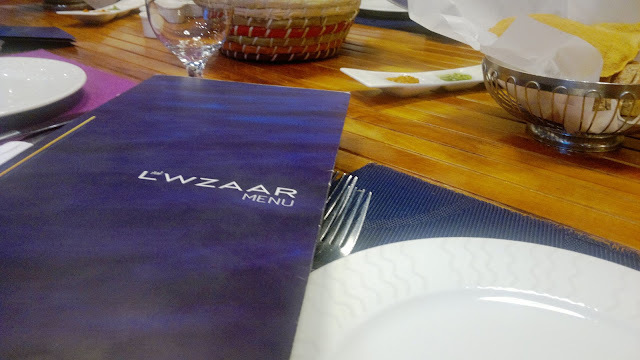 Some people in Dubai told us na most of the brands in Wafi are expensive and yeah its really expensive cos mostly are high end brands, pero hindi naman shopping yung ipinunta namin doon, we are looking for a place we could eat our lunch. Tip #7 Use comfortable footwear - as in yung tatagal sa lakaran, yung hindi masakit sa paa at be sure matibay :-) I advise ladies to wear flat sandals or flip flops so your feet can breathe. I'm only on my first day :-) hopefully I can continue until day 5 and give you some advices based on my personal experience. And I hope this will help you in planning your trip especially Eid Holiday is already near. Encounter with the Guard "on guard"